Thank you to all my friends on the Island who were so supportive during my hospital stay and recovery. I loved all the flowers, cards, phone calls and nutritious food. And to my “better half” Michael Kamps, I cannot tell you how much I appreciate your help. Every time I walk past my perfectly made bed and perfectly folded laundry I thank the powers that be that I am so lucky. Not many men would put up with this, my fifth surgery since 2003. Now, on to much more important things. I recently had a leak in the deck around my house that went into the downstairs Island Flooring show room bathroom. This really is a “Showroom” bathroom. It is all marble and travertine stone with a stone sink and wainscoating chiseled from the travertine. Everyone says it is the most beautiful and unusual bathroom they have ever seen. The design is unusual enough that it has been involved in some “espionage” . of the unusual chisel work. I especially loved the woman who ￼said she just needed the pictures to match the color. “What color are you going to do your bathroom,” I asked. “White”, she replied. Strange—my bathroom is all browns and beiges. In addition my “friends” came in telling my friend Patti that I had said it was ok to use the bathroom—people she had never seen me with before. We did have to replace the ceiling in the bathroom after the deck was repaired and I stumbled on to Mark and Joyce of Brush and Bucket Painting. They do a lot of custom painting in this area and limit themselves to one job at a time so they can give it their full attention. I needed the ceiling a faux color to match the original paint. Joyce is such an artist with color that when she finished the ceiling I had her redo the entire bathroom. Her faux made the original paint job look flat and dull. The highlights really show now in the paint and people comment about the paint job as well as the beautiful stone work. One final word—my friend Carol Ciraulo has recently listed her beautiful home for sale on South Bayfront. Every time she lists the house someone comes along and takes things off her porch—she found poor Mini Mouse washed up in the harbor with her ears torn off. It is really a shame that someone would do that—Just tell her you don’t want her to leave the Island if it upsets you..
An old Real Estate adage has been “Underneath All is the Land”. Balboa Islanders hope so because decades ago visionaries dredged up sand, piled it up and named it, “”Balboa Island”!! So how did it get from there to a paradise for celebrities who stopped over at Amelia’s Between Los Angeles and the Desert in the 1960s. For vacationers from all over the world. And a community with intangible spirit supporting the “Balboa Island Parade”? The Balboa Island Museum wishes to recreate, document, and display in a chronological manner all pertinent information possible in their Balboa Island Museum to preserve the rich Balboa Island history. They hope to trace the evolution of Island businesses from the early times to what they are now. As well as the folklore and Island Icons that are why the Spirit of Community has prevailed. The Balboa Island Museum is asking for help from anyone who would like to donate pictures, documentation, stories, information and artifacts. This will all be organized and preserved by volunteers. It will be our legacy to the generations to come. Air Conditioned, Utilities & Internet Included. We are coming to September when our little Balboa Island Post Office may be reconsidered for closing. We received a year reprieve and the time is near for another evaluation. I hope everyone has opened a Post Office Box for several reasons: 1) It is the main revenue stream that is consistent enough to save our little Post Office and 2) the Newport Beach Police have recommended that we all do since we live in such a high traffic tourist area. It saves a lot of problems with identity theft. Identity theft can happen by someone just stealing the right piece of mail from your mail box. So opening a Post Office Box can save you a lot of time and trouble. And save the Balboa Island Post Office. For those of you who already have a box—talk to your neighbors. 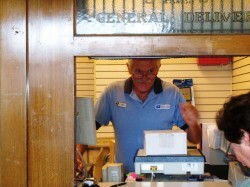 If our Post Office closes and UPS or FedEx buy the facility—your rates for the Post Office Box will increase—a lot. And neither of those companies offers the low cost mailing alternatives the Post Office does. Much has been said lately about the increased amount of dog feces on our Balboa Island Boardwalks even though the cost of Doggie Walk Bags furnished by the BIIA is $1000/month. The City is on a tight budget and cannot do any additional cleaning on the boardwalk. To our rescue comes EARTH SENTIENT, a Balboa Island 501c(3) charity whose purpose is to “Clean up the Earth” and whose Chairman is Bill Stewart. 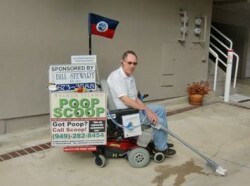 Bill has developed a machine called the “Poop Scoop” which you may have seen in the Balboa Island Parade in June. It is essentially a wheel chair fitted with sprayer, vacuum and various tools to clean up any messes left by dogs and even gum and candy, chocolate, etc. This letter was written by a 12-year-old girl from Atlanta, Georgia named McCall. She had no help from parents or teachers—I know, I asked her. (But she did go to private school as I did—it seems to be a great place to learn to write). Hi my name is McCall. I’m 12 years old, and live in Atlanta, Georgia. My parents got divorced when I was 5 years old and my father moved to California. We (my brother, sister and !) came and stayed for two weeks on the Island every summer to catch up with him. Since then, Balboa Island has become my home away from home. I’ll never forget the first time my dad let me go down town to all the shops by myself. I took my scooter and rode the 20 blocks from Topaz to Marine Avenue. My sister, Kelsey, who is 9 years old, would always go down to the Balboa Candy Shop and pick from the large variety of taffy Then, with our bags full of candy we would speed back to the house and watch TV with our dad while eating our new sweets. We were delighted when Tutti Frutti was put on the island. Each morning we would go down to Wilma’s and grab a delicious breakfast of pancakes. Everyday we would go down and get a little bit of yogurt before taking our hot dogs and pieces of strings to Crab Corner and catch crabs. Of all the things to do on Balboa, catching crabs was my favorite pass time. Once, I placed my piece of string, with a big piece of hot dog on the end, into a deep hole I had seen many huge crabs hide in before. Within seconds I had a gigantic tug on my string. I thought to myself “Whoa! This is a really big crab! Kelsey is gonna be so jealous!” Unexpectedly, a moment later I pulled out a fairly good sized fish! Neither I nor Kelsey knew how to unhook a fish, so we asked a group of teenagers who had been hanging out on the beach next to Crab Corner. They said that they could try, but after 30 minutes gave up. We waited for someone to walk by whom we could ask to help us. Finally a man walked by and said that he could do it, and sure enough, he could. We let the fish go and ran back to Topaz to tell our dad about the fish. Another thing I loved to do on the island was go to the Fun Zone. I absolutely loved the Bungee Jump. The extreme height made my head spin, and I loved the adrenaline that ran through me as I bounced up and down. The people who worked on the Bungee Jump always made me smile. I was also very happy when I broke the record of 152 continuous backflips the Bungee Jump. I was walking on air the rest of the week - haha. I guess the reason I wrote you this email is because of two reasons. 1) Balboa Island is such a happy place. You can’t be sad or angry when you are surrounded by such beautiful landscape and nice people. I have grown so much on Balboa Island and a piece of me will always be there. 2) I felt like I had to tell someone how much I adore this Island. And your email was the only one on the Website. 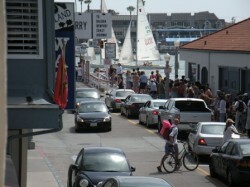 Sadly, because of the recent economy, I haven’t been able to get to Balboa Island in a while. Last summer I was unable to go, and I don’t believe I will be able to come out this year either. I’m not going to be away from Balboa Island forever. One day I will go back and see my favorite people and places again. Thank you so much for reading my email. I know it was long, and I appreciate you taking time out of your day to read about my story with Balboa. I tried to keep it as short as possible while including all of my favorite memories of the Island. A recent study found that 94% of children tested had compounds in their urine that indicates pesticide exposure. Kids with higher levels of the compounds in their urine were more likely to have ADHD. Food is the major source of pesticide exposure for infants and children, according to the National Academy of Sciences. Washing fruits and vegetables can reduce pesticide exposure, but the best option is to eat organic foods which are produced without toxic or persistent pesticides. And we need to be wary of any legislation that loosens the definition of organic. I was lucky—I grew up hating soda, my father and I used to “celebrate” with a root beer once a year. So it doesn’t surprise me when the doctors tell me at 65 the oldest bone in my body is 35 years old and my feet have 14 year old bones—no calcium leaching for this girl. However, what I really dislike is diet soda—1) The aspartame is linked to cancer and 2) The high sodium content actually makes you thirstier and the aspartame make you crave and eat more sweet foods. For every can of diet soda you drink daily you increase your risk of being overweight by 41 percent!!! Sugar is still less deadly than any man made substance. There are, however a lot of sugar free flavored waters—my favorite is HINT—no calories, nothing to harm us.